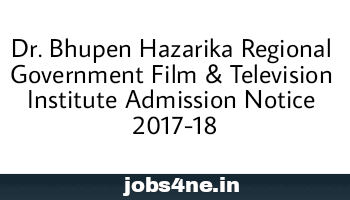 Dr. Bhupen Hazarika Regional Government Film & Television Institute Admission Notice 2017-18. - Jobs4NE : Jobs in Assam and North East India. Dr. Bhupen Hazarika Regional Government Film & Television Institute Admission Notice 2017-18. DR. BHUPEN HAZARIKA REGIONAL GOVERNMENT FILM AND TELEVISION INSTITUTE (An Academic Institute under the Cultural Affairs Department, Government of Assam), Approved by AICTE, New Delhi; Affiliated to SCTE, Assam, invites application for Admissions for the technical courses of audio-visual media for the session 2017-2018. Commencement of classes : 01-08-2017. 2. 3-yrs Diploma in Motion Picture Photography. 3. 3-yrs Diploma in Film and Video Editing. 4. 1-yr Certificate course in Applied Acting (Film & TV). A. Passed 10+2 in Science subject for SI. No. 1 and 2. B. Passed 10+2 in any discipline for SI. No. 3 and 4. How to Apply: Interested candidates may obtain Application Form along with Prospectus of the Institute is available w.e.f. 16th May 2017 at the office of the Institute at Jyoti Chitraban Complex, Kahilipara, Guwahati-19 on payment of Rs. 500/- in cash during office hours.